Winter is approaching and, as usual, we have been planning for it. For us winter means many things. The coal/wood burning stove has to be serviced, just the normal stuff, clean the chimney, check and renew the fire cement seals, the fire rope door seals and generally ensure it is ready to burn approximately a ton of smokeless fuel and half a ton of wood. It will burn 24/7 for about 4 months and provide us with warmth, free cooking and cheer. Our life is seasonal. Not just the traditional four either. We have many seasons, as does everybody else. During the warmer weather we have fly season, wasp season, flying ant season, spider season (Judy carries out more evictions than a mortgage company, none are harmed, just deposited on the towpath), harvesting season, blackberries, apples, plums of every colour are available along the canals and rivers and many more fruits if you look carefully. We are just entering the fire in the evening and the edible fungus harvesting (wish we knew more about which were edible!) seasons. A further difference is that we have to decide where we want our “house” to be during the winter. That depends on what we plan to do, some places are better than others for some things. 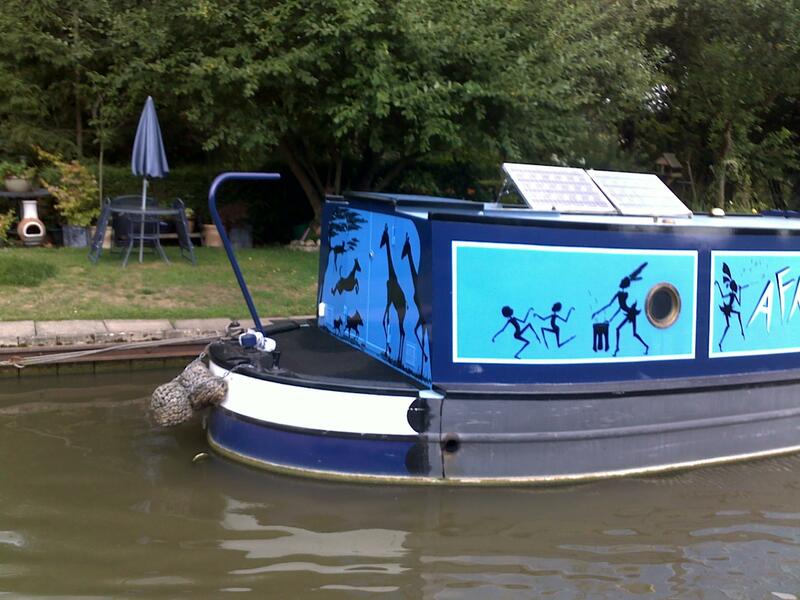 All must have the availability of water, diesel, pump-out (for the loo) and shopping. We are both reasonably fit and healthy (for our age) so there is no real requirement to be close to a hospital this year. We will take the decision when Deborah returns to Canada as to where we will overwinter this year. 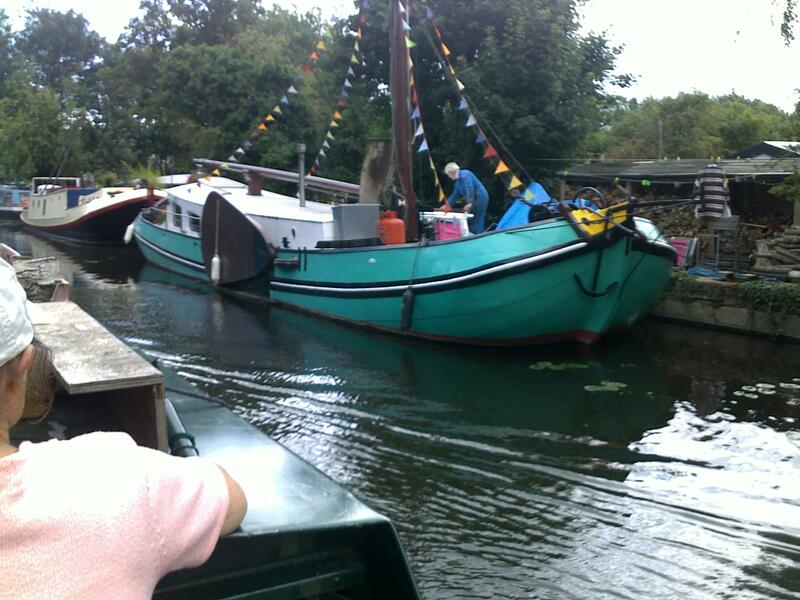 We have just finished cruising the Lee and Stort rivers. They were, somewhat surprisingly, a bit of a revelation. 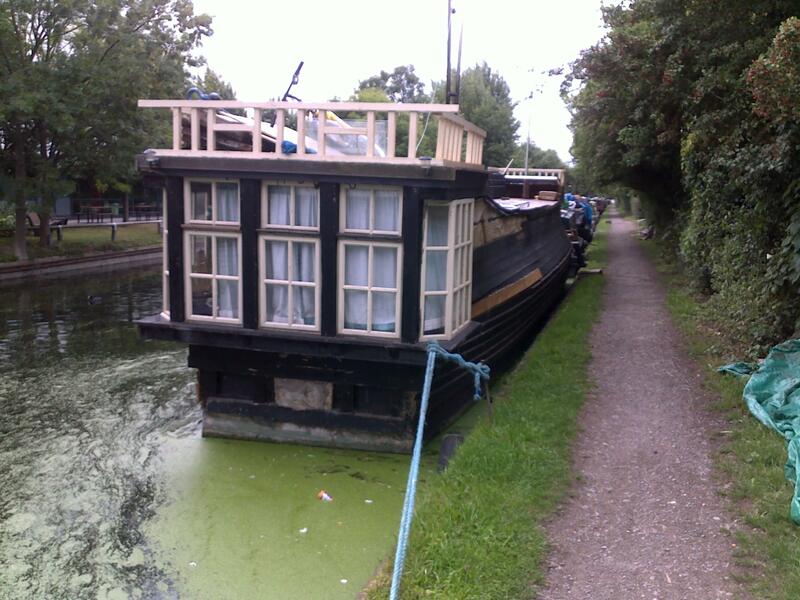 The Lee (or Lea) has been used as a navigation since Roman times and is very easy to cruise. 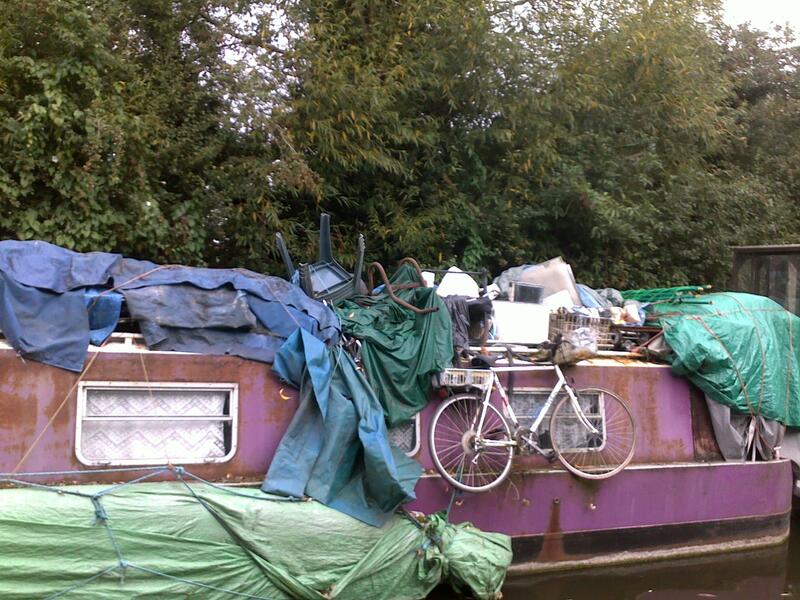 Plenty of moorings and even a few electric powered locks. The signs of prior commercial use are everywhere. The big, inset hooks are presumably to rope to when using the lock, after all 40 or 50 tons being thrown around in a lock takes a bit of holding. 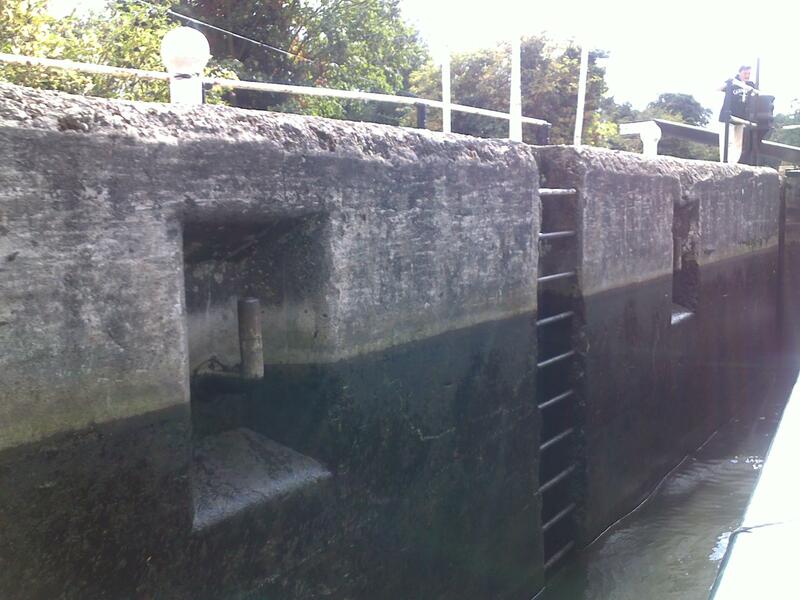 Some locks were even doubled up which tend to indicate there was a serious volume of traffic once. 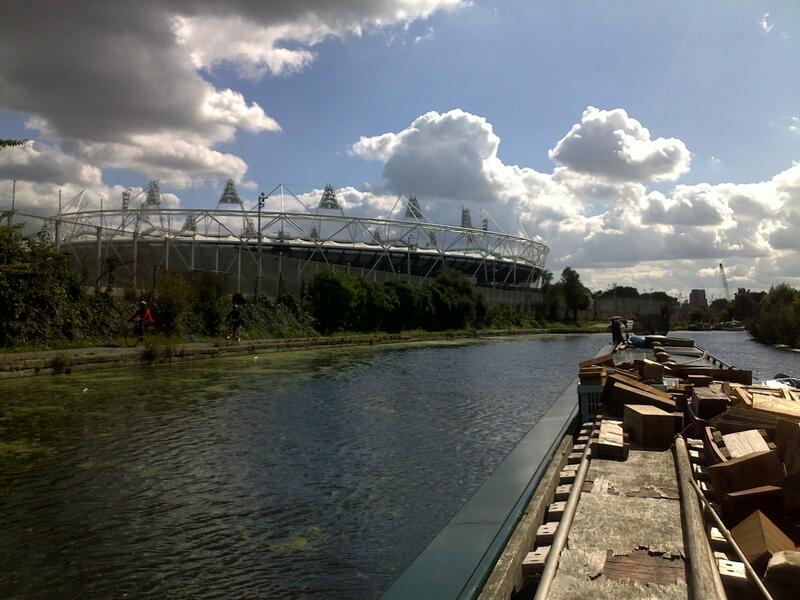 And that traffic may well return for a few days during the Olympics in 2012. The river Lee is close to the main events. The next picture is of one of a new stadium for the games. Mind you, the building programme is huge by any standards, this is a view from the Hertford Union canal close to the Lee. The air is filled with tower cranes helping to build another bit of the Olympics. All in all, the Lee was a friendly river, with friendly people. I wish the Thames was a bit more like the Lee. 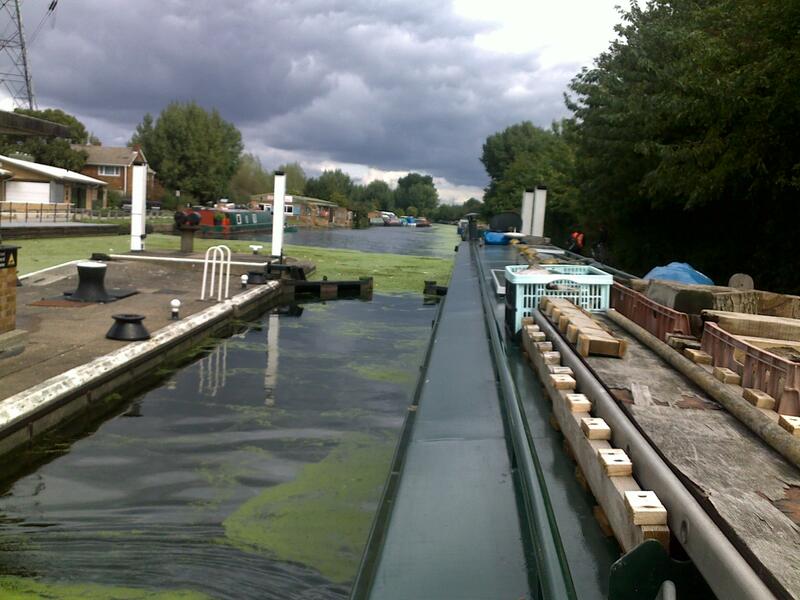 The Stort, which is a tributary to the Lee, was totally different. A truly beautiful cruise through the countryside. One of the prettiest navigations we have ever cruised. 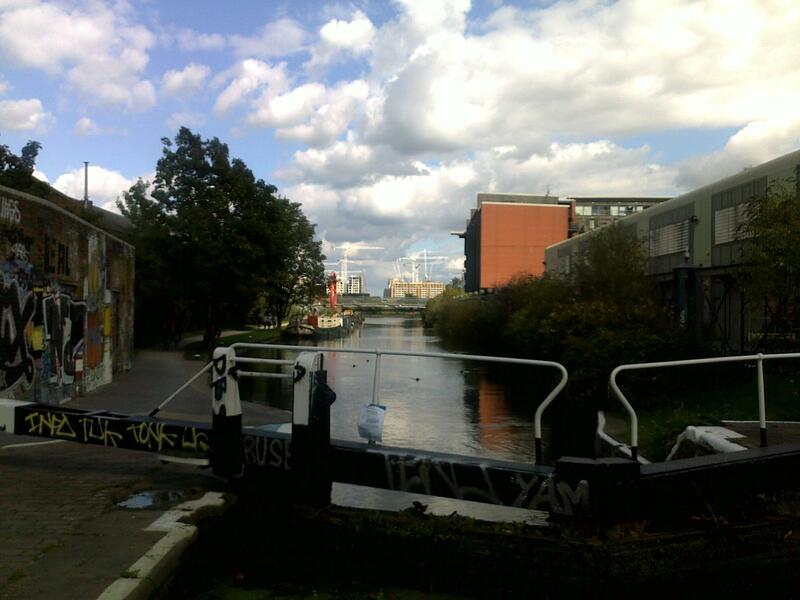 Now the trouble with pretty rivers or canals is there is nothing to take pictures of. We all know what a tree, a bush, and grass look like. Endless idyllic countryside is boring in other peoples pictures. You have to actually live it to enjoy it. 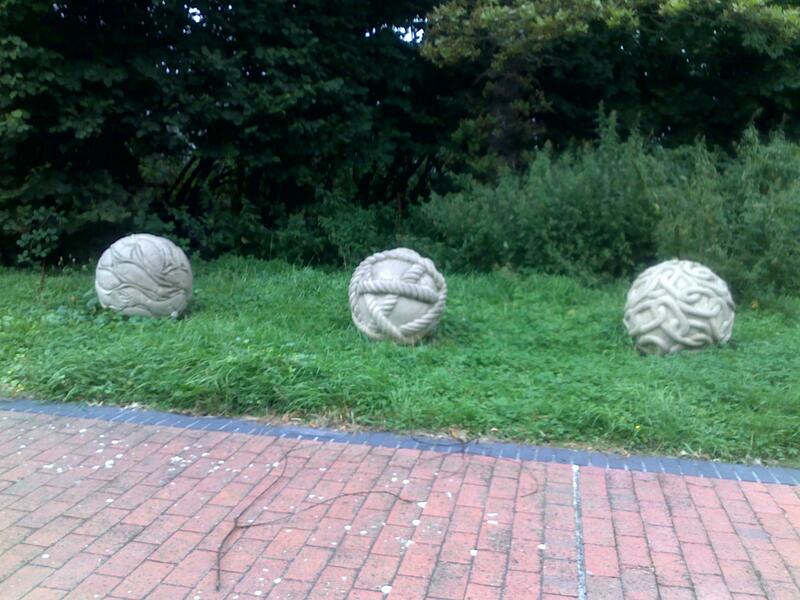 The only features that was interesting was these three carved stones some artist had left laying about at a lock. It takes planning to carve these bits of stone, imagine getting to the other side and finding the carving does not match! 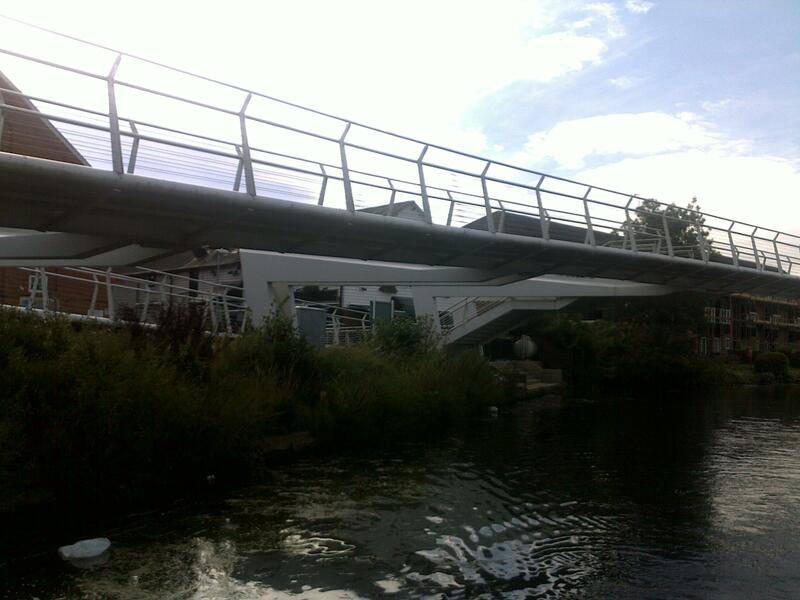 And this footbridge that had been somewhat over-designed and probably gave the welders nightmares for weeks. Whatever happened to the old ferryman and a bell at each side that you rang when you wanted to cross the river. 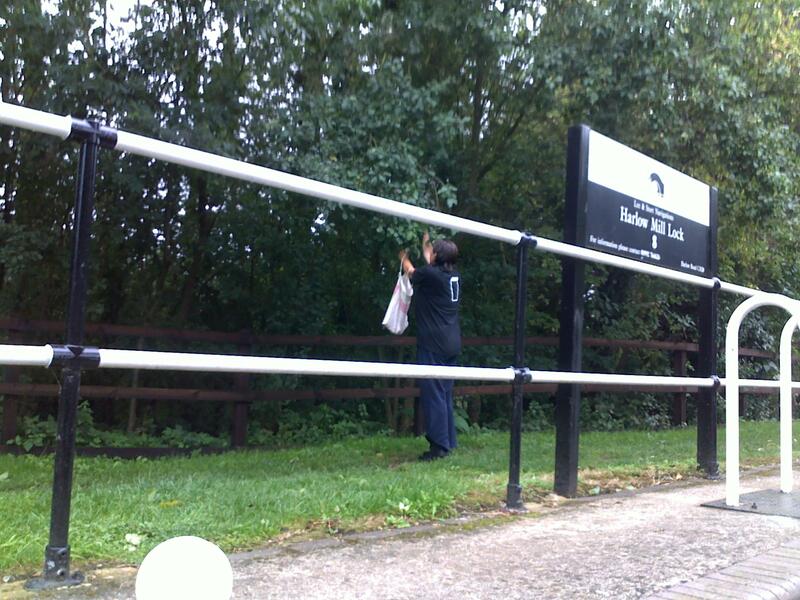 We carried out an animal rescue, a young squirrel playing on a lock could not get himself out, he had just found out that you can leap further down than up. When we arrived it decided to leap into the lock. We got it out and eventually got it to dry land (it only left a few teeth marks in a lock handle). 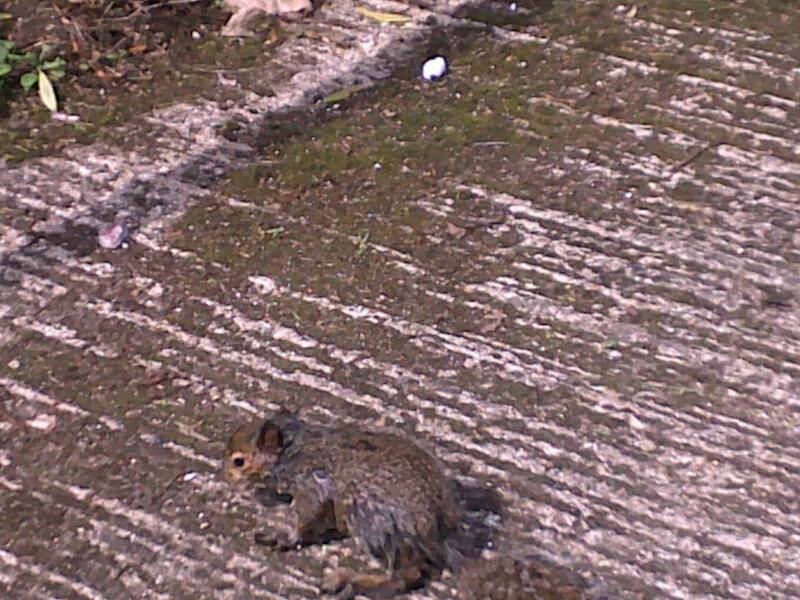 One sorry, soggy, baby squirrel. Let's hope it's parents collected it. We had seen them on the lock when we arrived. 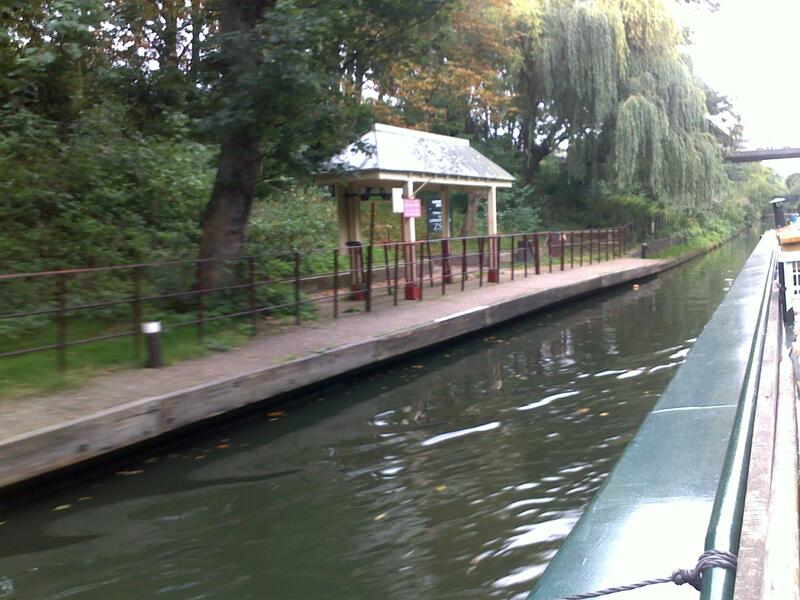 The Lee and Stort were great places to be. However we press on through London to be at up at Milton Keynes for when Deborah arrives from Canada. An easy cruising schedule but with a few stops. We picked up a couple of small solar panels to add to the two we already have (basically to maximise our return on investment). Details at the end for those interested. Just a quick pic for those who are not. 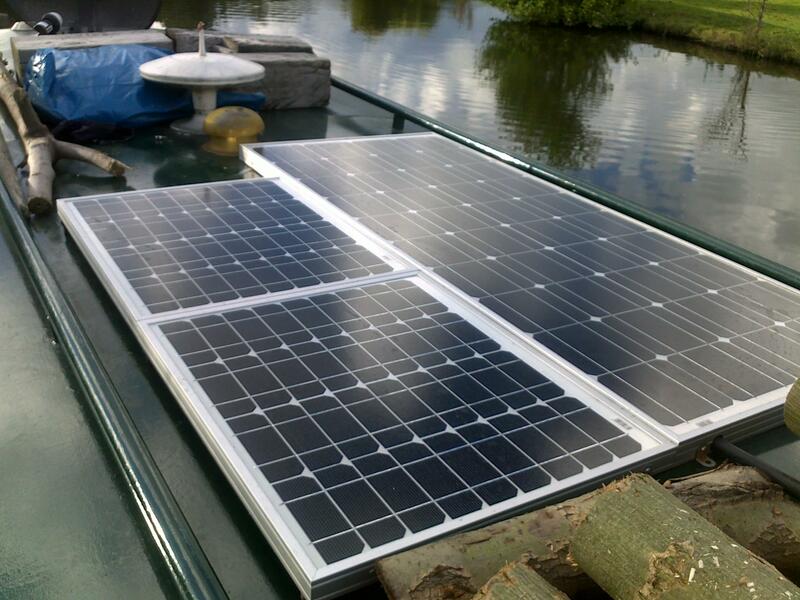 The 2 left hand panels are the new ones, 2 x 30 watts. 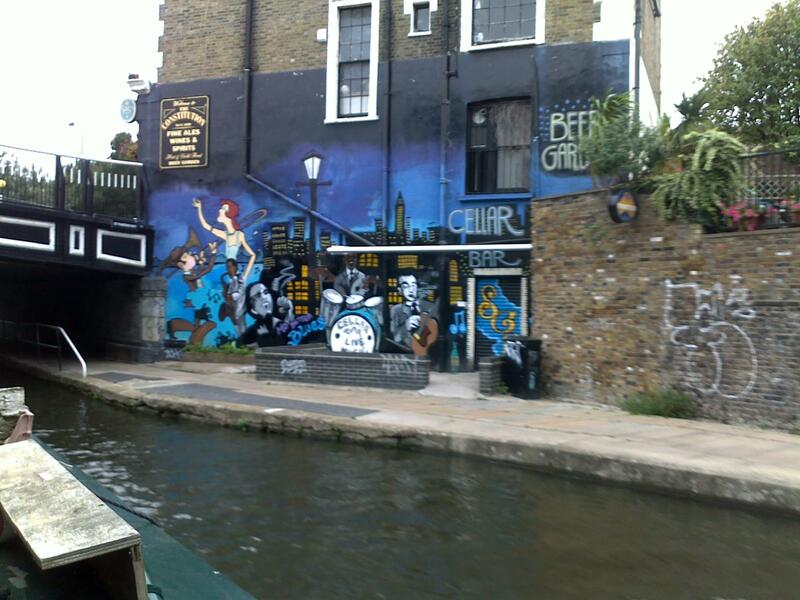 It's actually true that you have to cruise a canal in both directions to really see it, certainly it was true of London. I completely missed this on the way through due to the bridge and the bend. Now we had been cruising hard from 6am to meet our son when I took this snap and thought it would be much easier if I just had to steer and had a competent photographer like Nick aboard to take the pictures. Nick however lives in western Canada which makes it difficult. Within an hour Nick was actually aboard, my son had set me up for a surprise visit. Was it a premonition? I don't think so, just creative laziness on my part. However leaving the paranormal aside, Nick took some video and put it on You-Tube. (link is at the end). I had not seen Nick in half a lifetime. A truly awesome surprise!! But back to cruising, we passed through west London and back to Uxbridge and started up the main line of the Grand Union, a true treasure trove of strange smells from the food factories (one took me back to the smell of Bombay old town, I was in heaven for a few minutes) and a treasure trove of even stranger boats. 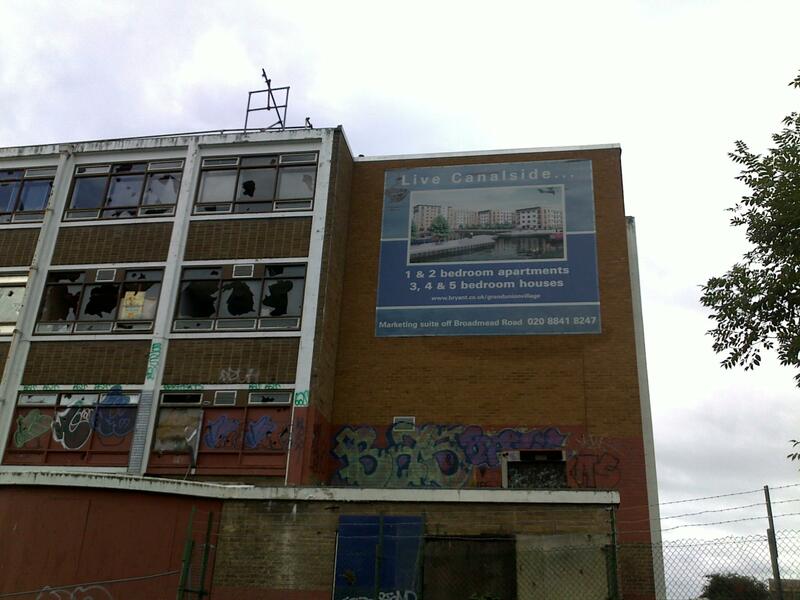 Mind you, some of the buildings are not much better! We are now well clear of London and back in our normal lush green environment, but being a Londoner I really did enjoy being back in “The Smoke” as it was called when I was a kid. There are sights and smells that are strictly big town things. I found it enlivening. We are now just a few days from our first close family reunion for some considerable time, we last all saw each other in Gloucester a few years ago when Debs was moving from Ireland to New Zealand so don't expect too much next time. I will be busy doing other things. 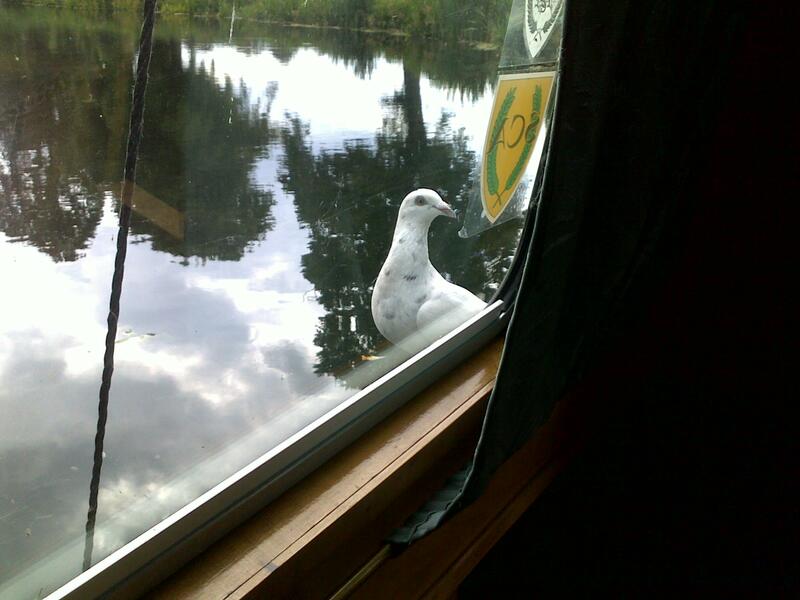 I leave you with this picture of a dove that was incredibly persistent at trying to get inside the boat, this was after we shut the door on it after it tried to walk in twice.